As first time home buyers, the process can be overwhelming and confusing. There are lots of moving parts, timelines and deadlines. Our job is to navigate through the process with you, always making sure you are comfortable, know what is coming next and that you are prepared each step of the way. FINANCING: Step 1 is to have your financing in order. Speaking with your bank or mortgage broker to establish your budget is number one. The bank requires information about your income and personal finances. Most times they require confirmation with documentation which can take some time to gather. Once the bank has what they need, you will receive what is called a pre-approval. This is the maximum amount the bank will lend you for a mortgage. HOUSE HUNTING: Once the bank has advised you on your budget, we are ready to hit the pavement and start checking out some houses! Be as honest with your agent as possible about what you like/don't like about each place, as this is really helpful in establishing what the perfect home looks like to you. It doesn't matter how long as it takes to find you the perfect place to call home, we will never rush you or push you. FALL IN LOVE: Finding "the one" is more of a feeling than anything else. You'll know when you've found the right place for you. MAKE AN OFFER: The first step in pursuing your dream home is making an offer. As your REALTORS® we will facilitate the contract and present your offer to the Seller's agent. When drafting a legal contract there are conditions put in place to protect you. Standard conditions can include Financing, Appraisal, Home Inspection, Lawyer Review and Condo Document Review (for condos). At this time an initial deposit is also due. This is money put forward to show good faith and forms part of your down payment. If a condition is not met, as long as you were acting in good faith, your deposit will be returned to you if the deal collapses. Financing: Different from your pre-approval, the bank still needs to finalize your file and provide a final approval. Appraisal: This is ordered by the bank and ties into the financing piece. The appraisal determines if the value of the home is equal to or greater than the purchase price. The bank does not want to loan you more money than the house is worth. Home Inspection: This is your chance to go through the home with a fine tooth comb. We recommend that you hire a third party home inspector who goes through the home looking for mechanical, electrical and structural deficiencies. Sometimes along the way you can find cosmetic imperfections or small repairs, which are good to know about, however we are looking for big issues that may have been overlooked during the house hunting experience. The home inspector will provide you a written report after the fact. From this point we can negotiate for repairs or money for repairs or if a problem has been uncovered that you are not comfortable with, we can collapse the deal and have your deposit returned. Lawyer Review: This condition gives you the opportunity to send the contract and paperwork to a lawyer to review. The lawyer reviews the contract, land title and Real Property Report in effort to avoid any potential issues. Condo Doc Review: When purchasing a condo, review of the bylaws, financials and general operation of the condo is very important. Some banks even require their own review. You want to know that the condo you are buying is a part of a well run establishment and that the building has been maintained and has enough money to keep up the maintenance in years to come. There are third party condo review companies who take on this process, which we highly recommend. NEGOTIATIONS: Once an offer is presented, the seller has the option of accepting your offer as is, declining your offer, or submitting a counter-offer. The dance begins and goes on until an agreement between both you the buyer and the seller has been reached. As your REALTOR® we work to reach as many of your objectives as possible, whether that be price, possession date or that blue couch you fell in love with and want to keep. CONDITIONS: With an accepted offer, the next step is moving forward to remove any conditions placed on the offer. With an offer in place, you are expected to move forward in good faith and do your best to fulfill your conditions. Once each condition is satisfied, you sign off on the conditions and at this point the house is SOLD! ADDITIONAL DEPOSIT: Once all conditions are removed, an additional deposit is due at this time. Again, this forms part of your down payment and is held in trust at our brokerage. UNCONDITIONAL: With the conditions removed and additional deposit submitted, the SOLD stickers go up and now we wait for the possession date. Time to start packing! A week or so before possession you can expect a call from your lawyer to make an appointment to sign your final paperwork in preparation of possession. 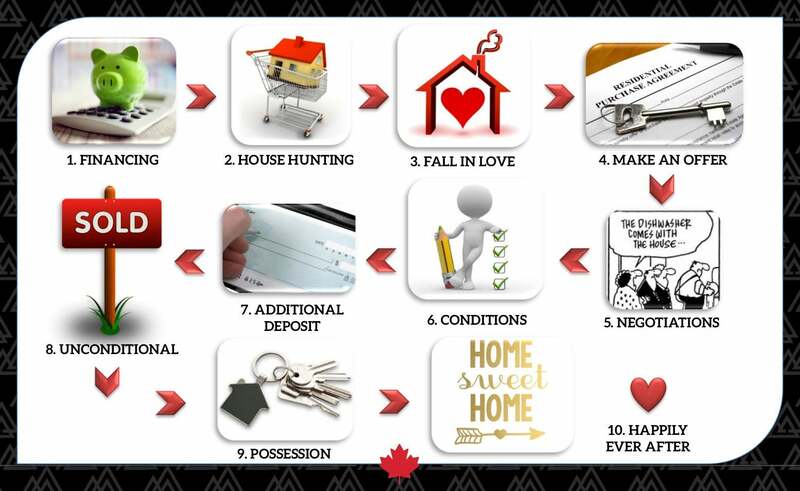 POSSESSION: A day or so prior to possession we will complete your buyer walk through. This is a chance to walk through the house one last time before possession to make sure the house is in the condition expected; clean or that any agreed-to repairs have been completed. On the day of possession we will receive a phone call from the lawyers once the funds have been transferred to the sellers. At this point you will receive the keys and the house is yours! HOME SWEET HOME: Time to unpack and settle in. Don't forget to invite us to your house warming party! Yes, there are lots of steps, but with help from us there is nothing to stress about! Let us help guide you through one of the biggest purchases of your life. We want to make it fun and seamless for you!